Home » Some of the characters . . . Some of the characters . . .
Susan Stroman, multi-Tony-winning director and choreographer of Broadway’s Contact, The Producers and Young Frankenstein, arriving at PNB to create a brand-new ballet to three Dave Brubeck jazz classics. Her unusual methods are highly efficient, but by the time her piece finally hits the stage, the lack of rehearsal time makes her frantic. Christopher Wheeldon, one of ballet’s fastest-rising choreographic stars. After he delegates the teaching of his comedy gem Variations Sérieuses and finds it a mess less than 48 hours before its performance night, he must rescue the production from impending failure in a single day. Carla Körbes, the brilliant, sensuous Brazilian “It Girl” and Peter Boal discovery who overcame serious injury in her teens to become a New York City Ballet soloist and PNB principal dancer. Cast as the lead in the company’s new Roméo et Juliette, Körbes develops a new injury that threatens to sideline her at the moment of her greatest success. Noelani Pantastico, the beautiful Hawaii-born, Pennsylvania-trained principal dancer who joined PNB at 16 but finds herself in Körbes’s shadow after Peter Boal takes over the company. Chosen repeatedly by visiting choreographers to lead the company’s major ballets, Pantastico becomes Juliet for the opening gala, gets demoted to second cast as Körbes’s star rises, and eventually finds herself struggling to cope with the ramifications of an injury that’s not her own. Jean-Christophe Maillot, the shaven-headed, charismatic director of Ballets de Monte-Carlo and choreographer of the Roméo et Juliette on this year’s PNB schedule. His arrival in Seattle magically transforms a looming disaster into a triumph—and lures dancers scurrying to bold and join his company. Twyla Tharp, a certified American genius, looking for dancers to appear in a brand-new work (or maybe multiple works) and driving the management crazy with her indecision about what that new piece (or pieces) will be. Bernice Coppieters, Maillot’s intense, stunning muse, partner, and original Juliet, who arrives in Seattle to transfer the part she owns to new dancers for the very first time and does it with precision, warmth and generosity. Marcia Dale Weary, a tiny, spunky 75-year-old, whose failure to become a ballet dancer more than 50 years ago led her to start a school and company in Carlisle, Pennsylvania. Thanks to her relentless, dedicated, hands-on instruction, it has become a multi-million-dollar institution that is now one of the world’s most reliable ballerina factories. Kay Mazzo, Jock Soto and Suki Schorer, three former New York City Ballet stars who have settled into distinguished teaching careers at the School of American Ballet, George Balanchine’s most lasting and influential institution. In the school’s Lincoln Center studios, they challenge the most talented ballet students in America. Sara Pearson and Patrik Widrig, celebrated avant-garde choreographers working for the first time with ballet dancers—on a performance involving a rolled-up rug, spinning plates, baskets of vegetables, and hundreds of California oranges. Christine Redpath, former New York City Ballet soloist and current ballet master, grimly and painstakingly teaching dancers how to wring every last drop of hilarity from The Concert, a 1956 comic ballet by Jerome Robbins. Nasha Thomas-Schmitt, a former Dallas Cowboys cheerleader and dancer with Alvin Ailey American Dance Theater, getting down on the floor to undo decades of formal ballet training and get her all-female cast to acquire the unique movement style of the late Ulysses Dove’s muscle-straining Vespers. Edwaard Liang, the muscular but sensitive choreographer and New York City Ballet dancer, who restages his quiet piece on the PNB’s dancers and discovers surprising improvements along the way. 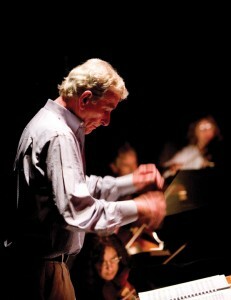 Stewart Kershaw, the dapper British founder and conductor of PNB Orchestra and veteran of major ballet companies in England, France, and Germany, walking a delicate line among dancers, choreographers and his musicians at the service of the dance rather than just the music. Rico Chiarelli, PNB’s sly, laconic longtime technical director, managing his stage crew with sharp curses and dry jokes as he braves deadlines and plays his incandescent instruments to create the music of lighting. Bruce Wells, former New York City Ballet soloist under Balanchine and longtime choreographer with Boston Ballet and Pittsburgh Ballet Theatre, who continues to make new dances while he serves as one of PNB School’s most beloved teachers. Kent Stowell, PNB’s crusty, irascible longtime resident choreographer and co-artistic director, bringing his beloved Maurice Sendak-designed Nutcracker back to life for its 24th consecutive Christmas season and 950th performance. Francia Russell, Stowell’s wife and former co-artistic director, who learned George Balanchine’s dances in his New York City Ballet company and became his ballet master and emissary, conveying her version of his works to PNB’s dancers with precision and discipline. Paul Gibson, former PNB principal turned ballet master extraordinaire, who works with incoming choreographers to learn and teach dances and manages contentious negotiations to create the dancers’ insanely complex daily schedule. When a cast proves unavailable to rehearse with the orchestra, Gibson and his photographic memory get pressed into service to perform all the parts of a ten-person dance. 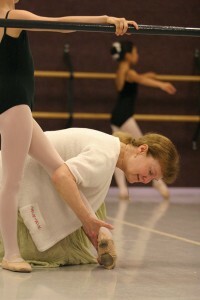 Patricia Barker, PNB’s greatest star, now retired from the company but passing her gifts along by teaching talented young students how to do the 32 fouettés it takes to be a Black Swan. D. David Brown, onetime Boston Ballet principal, who as PNB’s executive director makes PowerPoint presentations dance across screens in the goal of maintaining the company’s quality while stretching an always-limited budget. More world-class PNB dancers, hailing from Mongolia, Japan, Belgium, France, Brazil, Cuba, Utah, Virginia and points in between, displaying and explaining the grit, talent, luck and hard work it takes to pursue a career in ballet. Their life stories take them around the country and around the world in their teen years and beyond as they navigate the Land of Ballet. And, inevitably, Peter Boal, the child of privilege who danced for George Balanchine and Jerome Robbins and Twyla Tharp. Singled out for brilliance in The New York Times at the age of 12, he had his own apartment in New York at the age of 15, founded his own dance company while performing at City Ballet, and ended up transforming a Seattle institution by bringing in so many unfamiliar works that the dancers find themselves delighted and exhausted.